I am often asked which is the best rug. The Persian is certainly the best-known, but weaving is practiced in over 40 countries throughout the Middle East, from Africa right across to China. 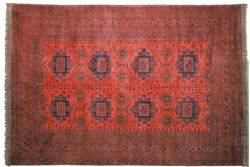 The technical qualities and the appeal of any rug go back to the individual weaver's skills and experience. Every country therefore has examples of both the superb fine weavings of the cities to the lower quality, yet equally charming, looser weavings of the tribal and nomadic people. At Four Corners we are continually searching for the best examples from all of the different weaving countries, with particular emphasis on rugs from Afghanistan, Iran, Turkey and The Caucasus. It’s important to remember that when you purchase a hand woven rug, you’re buying a work of art. The rug’s beauty, harmony, character and personal appeal are more important than its origin, history or age. The name Afghanistan immediately brings to mind the rugged mountains and harsh climate of this country that has been plagued with wars, political instability and drought. The conditions there have made the selection of rugs now much more limited than even five years ago, as there are only about 25% of the weavers left who are able to weave in their homes today. Because it’s too dangerous to travel around Afghanistan now, I’m sourcing my rugs in the old city of Peshawar, on the Afghanistan-Pakistan border. I buy from Mr Abid, an elderly Afghani who has spent his life, as his father did, travelling the remotest parts of Northern Afghanistan, Turkestan and Uzbekistan. Twice a year I visit him to select from his fabulous collection of old and interesting rugs that he has gathered during his travels and kept for his favourite rug traders from overseas. Afghani rugs are becoming more sought-after; they go particularly well in our New Zealand homes, where they look fabulous on hard floors, especially polished wood, floors and under big, formal dining tables. From the highly ornate silk rugs of Isphahan to the tribal weavings of Quashgai Nomads, weaving has always been a matter of national pride in Iran, or Persia as it was formerly known. Persian rugs have such a huge variety of quality, design, colour, size and construction methods. This is due in part to the many different ethnic groups that make up Iran's population – from Kurds to Armenians, Bakhtiaris to Balouchis. All maintain their own heritage, traditions and cultures and weavings reflect their unique character and lifestyle traits. The depth of character in tribal carpets easily differentiates them from the formal city rugs. Tribal weavers use stylistic images and symbols of what they see in nature and the environment ... sun, flowers, trees, birds and animals. On the other hand, city carpets have extremely fine details showing off magnificent woven gardens, hunting scenes and depictions of the ornate tile work seen in the ancient mosques. Traditionally, rugs from Persia are either geometric or curvilinear – floral – in design. They feature the Senna knot and are made of wool, animal hair or silk. Some of the more famous rug weaving districts in Iran are Tabriz, Isphahan, Qum, Kashan, Nain, Shiraz and Kerman. This is the area that takes its name from the major mountain range from the Black Sea to the Caspian. Caucasus is a former Persian province and weaving dates back to the sixteenth century; rugs show the influence of the region's early Christian and Muslim heritage. I am always on the lookout for old Caucasian rugs but this gets steadily more difficult as world demand means that very few actually get to market. I have to rely on contacts in Turkey to get Caucasian rugs from the Russian and Armenian travellers who manage to cross the borders with them. Their primitive charm and increasing rarity means these rugs are becoming very expensive. One client of mine recently sold an antique Talish runner at auction in London and found it had increased its value by seven times what they paid for it ten years ago! Caucasian rugs typically feature brilliant colours, highly-stylised geometric motifs and bold designs. Many have dates from the Moslem calendar woven into their pattern. They are woven from durable handspun wool for extremely cold conditions and will often come from Sirvan, Kazak, Karabagh, Baku and Kuba. While antique and traditional rugs are the most highly sought-after, many modern homes have plain or neutral interiors and so require more simple rugs. Floor accents, rather than coverings. For such homes, we have a selection of contemporary hand woven rugs whose designs are strong and colours pure. These rugs have the depth of character that comes from the blending of traditional dying and weaving methods from the East with the innovative style of European design. Using New Zealand wool and natural vegetable dyes, weavers in Portugal, Nepal and Tibet create durable, beautiful rugs in four hundred different designs, each of which is available in six sizes. See our catalogues for a selection of those available.